Is the future a high-resolution game? “Never before has humanity been able to encounter the future in such detail, to measure the forces of change at such vast scales, and to fill in the details with such fine grain. As we play this game, we find ourselves in ever more layered and nuanced futures that often look distinctly different across geographies, across cultures, and even across the various identities each of us claims. As we try to grasp the future of blockchain and other distributed computing technologies, we have to start here, with this high-resolution gamescape where there is no single blockchain future. Rather, we face an ecosystem of futures as complex as the global superorganism that we are actually becoming. We mustn’t forget that as blockchain technology unfolds into financial, legal, environmental, and biological realities, it will blend with other high-resolution technologies to change every assumption we have about what’s possible in the economy, in human society, and even the biological world. It will amplify and be amplified by a rapidly emerging capacity for high-res virtual reality simulations and games. The Internet of Things, including the Internet of Living Things, will create a highly distributed grid across which blockchain transactions of all kinds are negotiated by learning algorithms and executed by smart contracts. These transactions will, of course, be verifiable by millions, maybe billions of mobile computing devices. Biological programming—editing the individual genes of individual cells for specific functions—will open a vast and contentious landscape of biological transactions to be provisioned, regulated, and supported by blockchain architectures. Even as companies and consortia are trying to discover the core application zones for this newly-distributed computing technology, we need to look ahead to unexpected intersections of high-res technologies if we really intend to see the array of unexpected scenarios that lie in wait in the high-resolution blockchain future. For example, for the most recent Ten-Year Forecast, entitled “The Future Is a Rite of Passage,” we posited a Virtual City Council. We were inspired by Pia Mancini’s Democracy OS, which ultimately imagines a digital platform for global citizenship. This scenario brings citizenship into your 2030 virtual 3D game room and integrates it into everyday choices of what you eat, what you buy, and how you play. But unlike China’s controversial 2020 citizen scoring proposal, the Virtual City Council is not a top-down centralized social or citizenship scoring system. Rather it’s a bottom-up distributed tool set for aggregating large groups of people with similar interests, needs, and values into civic affinity groups. 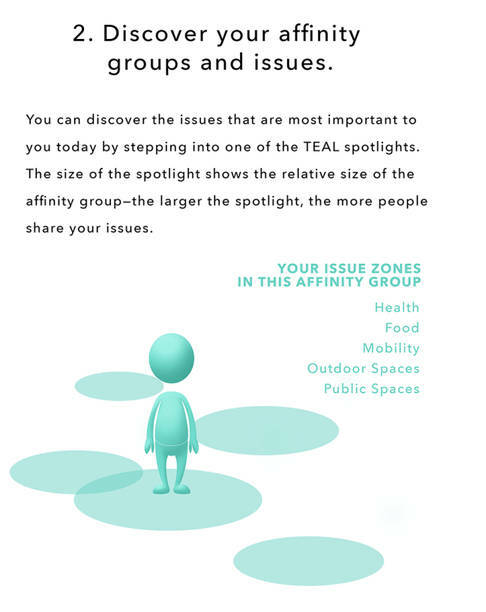 Where individual preferences and priorities might otherwise get lost in the fragmented consumer landscape of targeted advertising, they now form the basis for connecting like-minded people across citizenship issues ranging from health and food to safety in public spaces. 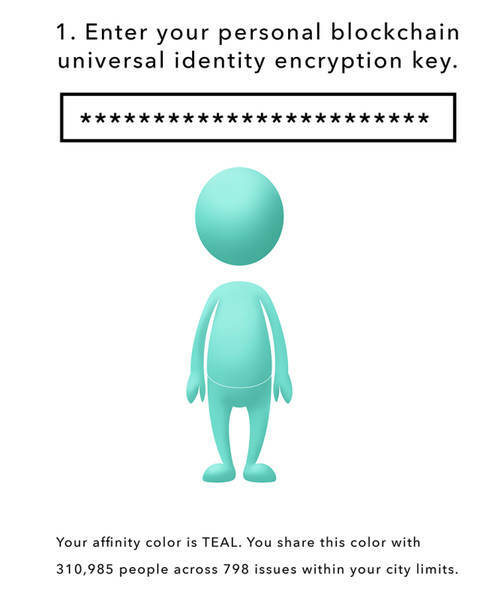 You start by granting anonymous access to your encrypted transaction records across the many blockchains you use in your daily life. 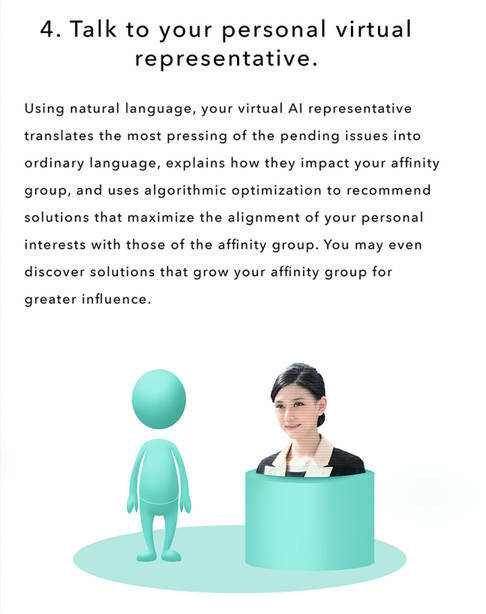 Without revealing your actual identity, you can tap the intelligence of virtual digital assistants and learning algorithms to discover the issues that are most important to you. Your virtual immersive reality represents these affinity groups as spotlights in 3D space. 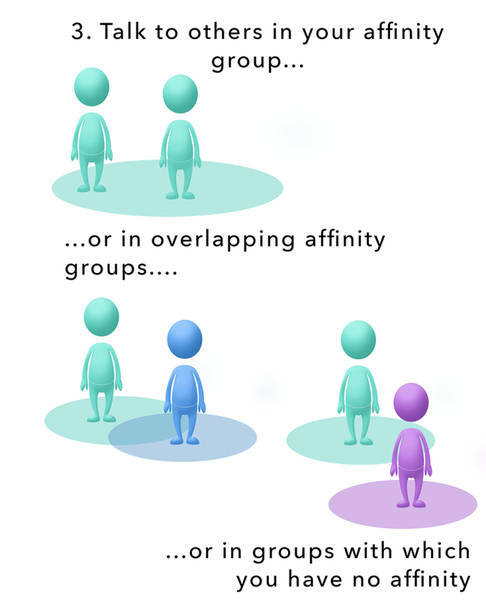 You move from spotlight to spotlight to discover your affinity groups. This virtual city council is not simply passive profiling, however. You can interact with others to explore the issues with people who are a lot like you, a little like you, or very different from you. These interactions create the opportunities to develop more nuanced affinities with large numbers of people. You might also draw on your personal virtual representative to learn more about issues that often have seemingly intractable dilemmas at their core. Behind this virtual representative, we might well find a set of optimization algorithms that look the best solutions for the range of citizens. In this world of game room governance, you can test your decisions or votes or donations to see how they change your affinities—and ultimately grow or diminish your influence. In other words, your virtual city council provides immediate feedback loops to help you refine your decisions and personal actions. 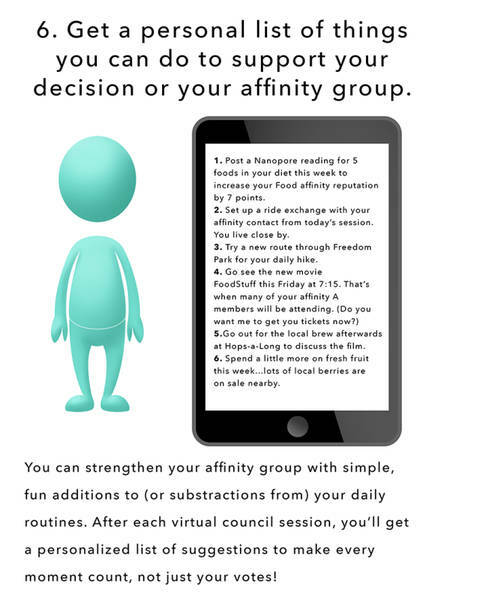 And speaking of personal actions, you can even get a “to-do” list of activities that can strengthen your affinity group culture. This scenario is not a prescription for the future. It’s simply a provocation for thinking about what’s possible when blockchain tools intersect other high-resolution technologies on the not-so-distant horizon. It shows us a way that entirely new identities, including collective identities, might emerge over the next decade. It shows how the affordances of transparency and pseudonymity might actually build more cohesive and functional societies from very high-resolution transactions. Ultimately, it calls on us to think beyond the next killer blockchain app to imagine the different kinds of worlds we’ll find ourselves building as distributed computing defines the next era of digital society. This article first appeared on Institute for the Future and was republished with permission. Kathi Vian is a distinguished fellow at the Institute for the Future. She looks at the global future through three intersecting lenses: the evolution of smart networking and social media, the innovations in open economies and the extreme environments in which human communities will evolve.